Track improved contact center performance with dynamic reporting for better overall business management. RiverStar Reporting Engine is an add-on to Unified Agent Desktop that allows you to extend the value of workflows with dynamic reports. 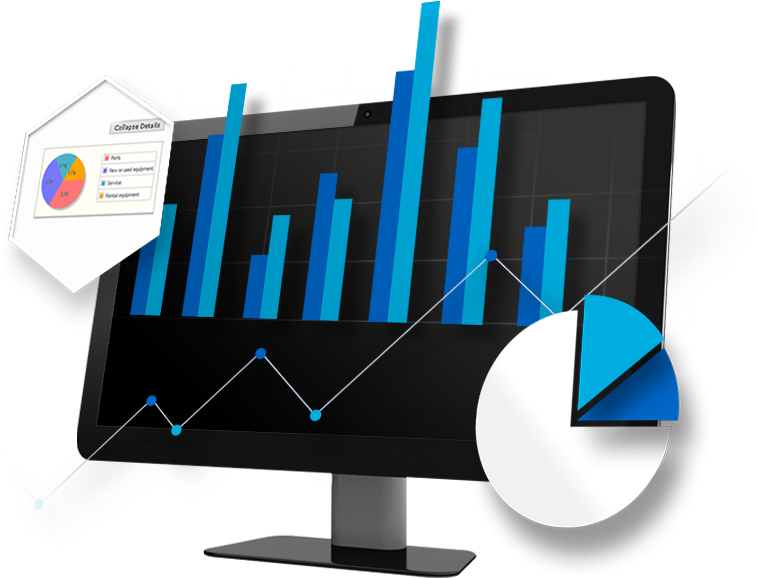 RiverStar Reporting Engine allows you to track customizable KPIs that are critical to your business or industry. Develop dynamic reports that can be shared with your team of peers, employees or senior management to track and drive business change. Administrators can easily define what data elements are trackable and define a custom set of reports that reflect those data elements. Every click, keystroke, or agent disposition can be carefully tracked and visible for reporting and analytics purposes. Reports can be viewed in a variety of ways to provide actionable business insight to improve operational results. Reports can be presented in multiple formats — tables, line charts, pie charts, bar charts, etc. — and can include complex on-the-fly computations. The reports can be run ‘on the fly’ or scheduled to be run at specific times or intervals (daily, weekly, monthly, quarterly, annually). Reports can be sent to unique distribution lists on a pre-determined schedule or posted to a web portal as a .pdf, .xls or .csv file. Ready to get started? Want to learn more? Either way, we want to hear from you. RiverStar provides customer-focused business process solutions that help drive customer loyalty and improve the customer experience. Over the past decade, we have built and refined our solutions to optimize customer interactions. © 2019 RiverStar. All rights reserved. Fill out the form below to downloaded your requested resource. Visit the self-service support site to receive global 24/7 support, how to videos and articles, best practices, training materials and more. Visit the client support ticketing system to receive global 24/7 support for existing customers only (registration required). Get in touch with us today to discuss your needs and schedule a one-on-one consultation. Randal has twenty-five years of experience providing consulting services in the area of business and information technology. He provides the technical vision and direction to the company. Randal’s primary focus for the last 20 years has been on providing solutions in the customer service interaction space targeted at improving the end customer’s overall experience regardless of the channel used to request support. He has hands on experience with a broad range of development technologies and platforms including Visual Studio.Net, mySQL, SQL Server, Oracle, Sybase, Informix, C++, C#, and Java. Randal earned a Bachelor of Science in Computer Science and Operations Management and Information Systems from Bradley University. Bob has over 40 years of experience in communications and technology. He provides the strategic vision and day-to-day operations management of the company. Bob is a well-respected leader and pioneer in software development and contact center solutions. Over the past 25 years, Bob has served as the top executive for organizations spanning IP Monitoring and Analysis, Wireless Fraud Control and specialty Object-Oriented Consulting. While leading mission critical efforts for Fortune 500 companies such as Bell Labs, AT&T, Ameritech and Bellcore, Bob focused on the integration of leading edge network and operations technologies. Bob’s educational background includes a PhD in Systems Engineering and a Masters in Mechanical Engineering from the University of Arizona. His bachelor’s degree in Mechanical Engineering was received from Carnegie Mellon University.